A boy in love with his land who succeeds the extraordinary undertaking of producing a surprising metodo classico on the eastern hills of Friuli, an area much better adapted to still wines. A region still scarred by the tragedies of war, but that gives the gift of hope for the future. 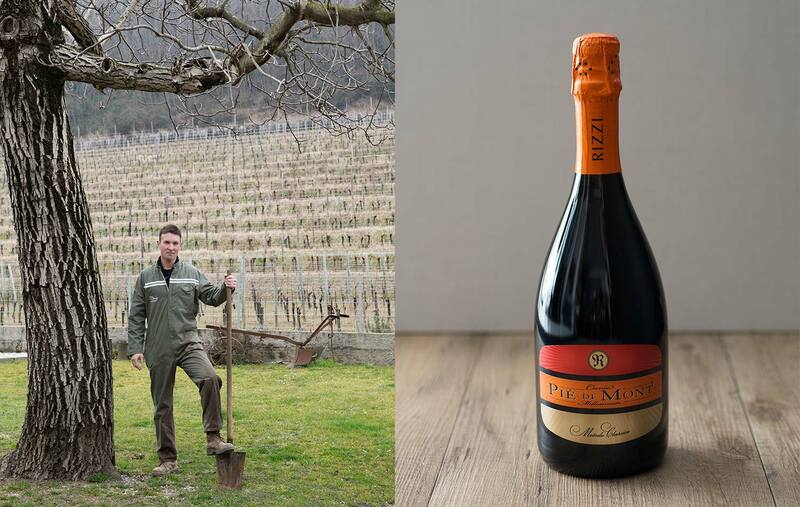 The most inspiring stories emerge when experience meets passion, like that of Piè di Mont, and the story of a father and his son who unite in their passion for sparkling wine. Together, they followed their dream of producing the only Spumante metodo classico Millesimato in a territory already famous for its still white wines: in the eastern Collio hills of Friuli Venezia Giulia bordering Slovenia. Roman Rizzi was born in these hills and grew up on his parents’ farm in Piedimonte, Gorizia. He spent his boyhood among terraced vineyards, orchards, farm animals, and a huge country home. There, in the summer, his mother Mayda would set out a green-leafed branch, a signal in these parts for those who know how to interpret it – it means that the house is open to the public, and anyone may come to purchase their farm fresh products or eat under the shade of the courtyard trees. Mayda served and sold salumi, fruit, vegetables, eggs and, naturally, wines produced by the local farmers. The most well-known family talent is tied to grapes. Roman’s father Paolo, who’s nicknamed the “vine chiseler,” is an expert at planting grapevines by hand, an art that brought Friulian wines to international fame. He passed on his knowledge to his son, who immediately demonstrated a capacity and willingness to work that made his father proud. But it wasn’t the road I was meant to take. I was always in the vineyards helping my papà and I really liked it. The idea of making a sparkling wine became an obsession, and I became so impassioned with this work that I decided to follow my dream. Paolo and Roman paid visits to all the sparkling wine sanctuaries, from Champagne in France to the land of Cava in Spain, returning to Franciacorta in Italy. They wanted to learn all the secrets of bollicine so they could bring that knowledge back with them to their home in Friuli. In 2002, they converted the family farm to a production site for metodo classico – the same bottle fermentation method used for champagne – and today, the business has officially passed to Roman’s hands. Roman is just 29 years old; yet he combines youthful enthusiasm with ancestral dedication to his work and respect for the products of the earth. The people of his region have done the very same for generations. He answers our questions with the precision of an enologist, almost embarrassed by our compliments, telling us all the details of this metodo classico production that is so rare and unique on this hillside. The secret of the Piè di Mont wine is the position of its single vineyard. It has southeastern exposure on a hill at the foot of Mount Calvario. In the summer, this special piece of land is already cast in the mountain’s shadow by about six in the evening. This quickly lowers the temperature, which in turn pushes the harvest to nearly the beginning of September. The longer the time spent on the vine, the more the grapes develop aromas and have a lower acidity. Here, the grape harvest is a big reunion of family and friends. They gather at sunrise to divide up the work and the various grapes, gathered separately by variety. The cuvèe that makes Piè di Mont is in fact already planted on the hill: the different grapes are planted together in the correct percentage, guaranteeing, year after year, a consistency of high quality and uniqueness. 20% of the wine is Pinot Nero, which gives it a full body; 20% is Ribolla, for its freshness; and 60% is Chardonnay, imparting an unmistakable elegance. The vineyard is little more than one hectare, like a secret garden untouched by machinery. Roman and his father planted the vines here 12 years ago by hand, one by one, pressing the earth over with their feet to ensure the roots grew without touching air, healthy and strong. The small size of the vineyard allows for harvest to be carried out efficiently in the span of one morning – from 6:00 to 9:00 – and the grapes carried into the cellar still fresh with the cool dark of nighttime. Here is where the long journey of transforming the grapes into this special wine begins. The three different grape musts are left to settle in order to start fermentation. They rest until January, when they are finally assembled and bottled with the liqueur de tirage (a small amount of sugar) for the secondary fermentation. The wine rests on its lees for 22 months, at which point the bottles, all precisely angled on the wooden racks called pupitres, are delicately hand-turned by an eighth of a rotation. This is called reumage, and helps to nudge the lees up towards the neck of the bottle. As is done in the production of Champagne, the lees are then disgorged, leaving the wine clean and clear. The precious 10,000 bottles that Roman produces every year are produced with perfection, a precision that sees each bottle taken in hand and turned 97 times before declared ready. The Millesimato wines are ready four years after harvest. Roman is quite young, but he has solid ideas about his future. He will not leave it all behind in the pursuit of monetary gain as so many of his peers do. He has his riches here already, in the hills, vineyards, and in realizing his dream and that of others who came before him, all of whom contributed to transform a land devastated by the horrors of World War II. It is a shy region, yet at the same time hospitable, to release such pearls as the Piè di Mont.